This is my first time making croissants. I made puff pastry once before, Vols-au-Vent with the Daring Bakers a couple of years ago and it was a little frustrating because the butter got soft so quickly. So this time I took tips from the You Tube videos of Julia making croissants with pastry chef Esther McManus. In the video they cream the butter and then chilled it again before incorporating it into the dough. I decided to spread the butter in to a rectangle the size that I needed and then chill it. This method was much easier for me and allowed me to work much more quickly. Only a little of the butter oozed out during the final turns and in the video Esther said that is to be expected. 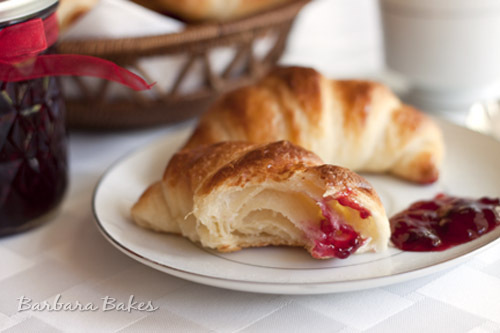 Also in the video, before rolling up the croissants, they added a little ball of dough from the scraps. This made it easier to shape the croissants and gave the center a little bit more height. The recipe makes 12 small croissants. I think next time I would divide the dough in to 6 croissants so they’re not so small. I doubled the final rising time to 2 hrs. but if I would have had more time I would have let them rise for 3 hrs. I incorporated my changes in the recipe below. 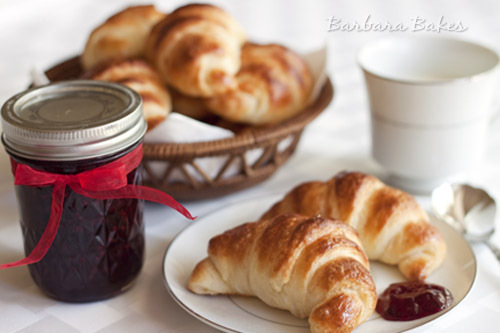 I served the croissants with homemade blackberry jam that I canned with Kelley, Mountain Mamma Cooks, and Maria, Two Peas and Their Pod a few weeks ago when we canned the peach salsa. The blackberry jam is so luscious and fresh tasting. A perfect compliment to my flaky, little croissants. The recipe is below. 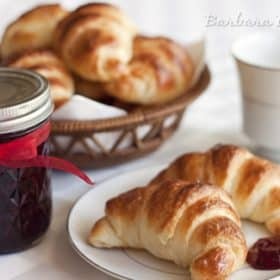 I took a little basket of croissants and a jar of blackberry jam to my daughter in the hospital. 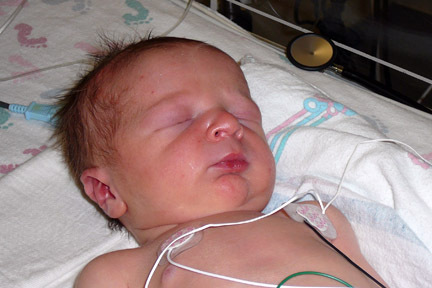 I can’t wait for him to come home and spend some quality time with his grandma. 1. Mix the yeast, warm water, and first teaspoon of sugar in a small bowl. Set aside for the yeast and sugar to dissolve and the yeast to foam up a little. 15. Place the stick of chilled butter on a silpat (silicone mat). Using a rolling pin, beat the butter down until it is quite flat. Use the heel of your hand or a offset spatula to spread the butter until it is smooth and measures 10 x 8. 16. Place the butter in the fridge to chill while the dough is on it’s second rise. 17. After the dough has double, place the dough in the fridge to chill for 30 min. 18. Remove the dough from the fridge and place it on a lightly floured board or counter. Let it rest for a minute or two. 21. Fold the bottom third of the dough up and the top third of the dough down. 24. Again, fold the top third down and the bottom third up. 25. Wrap the dough package in plastic wrap, and place it in the fridge for 2 hours. 26. After two hours have passed, take the dough out of the fridge and place it again on the lightly floured board or counter. 44. Cut the square into three triangles (as shown in the video.) Cutting off the corners on each end to create a diagonal line. 45. Stretch the triangle out a little to lengthen it. 46. Make three small balls of dough from the scraps and place a ball of dough at the wide end of the triangle. 47. Starting at the wide end, roll the triangle up towards the point, and curve into a crescent shape. 49. 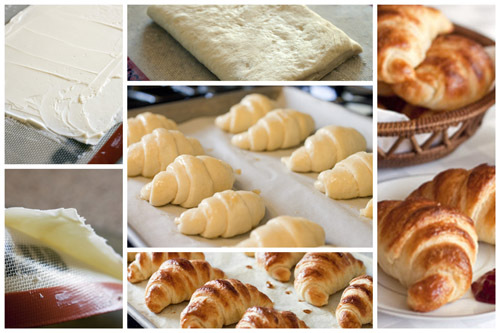 Repeat the process with the remaining dough, creating 6 croissants in total. In a large, deep stainless steel saucepan, combine blackberries, lemon juice and sugar. Over high heat, stirring constantly, bring to a full rolling boil that cannot be stired down. Stir in pectin. Boil hard, stirring constantly, for 1 minute. Remove from heat and skim off foam. Ladle hot jam into hot jars, leaving 1/4 inch headspace. (If you wanted to make seedless jam, you could strain it before filling the jars.) Wipe rim. Center lid on jar. Screw band down until resistance is met, then increase to fingertip-tight. Place jars in canner, ensuring they are completely covered with water. Bring to a boil and process for 10 minutes. Remove canner lid. Wait 5 minutes, then remove jars to folded towel on counter and do not disturb for 12 hours. Check that the lids have sealed. If they didn’t seal, put in fridge and use within 2 weeks. Thanks Sarah for a delicious challenge! Please visit the Daring Kitchen to see a slideshow of the fabulous croissants the Daring Bakers created for this challenge and the original recipe.